Branding is more than just signature colors, a slogan, and a logo. It’s an idea—a collection of thoughts and feelings people associate with your organization. And when this idea is well executed, it powers your fundraising. “Brandraising,” a term coined by Big Duck founder, Sarah Durham, is a specific fundraising strategy that uses brand awareness activities to fuel a nonprofit organization’s development efforts. The idea is that strategic brand awareness communications and fundraising have a direct relationship. With all else held equal, the assumption is that as one increases, so does the other. In a world of content saturation on and offline, strategic investments in branding will help your organization differentiate itself from the crowd and raise awareness and revenue. To help you strengthen your brand and make it recognizable, we’ve outlined the concept of brandraising and provided examples of how you can leverage this strategy. Long identified as a key component of successful businesses, a strong brand is also essential to the health of nonprofits. Individuals associate powerful brands with specific feelings and these feelings can influence donor behavior and keep your organization top of mind. A recent study reported 49 percent of nonprofits surveyed plan to increase their budget for social media communications, while 21 percent plan to increase email marketing. These are two communication levers your organization can invest more time and resources in to communicate these core branding messages. To build your brand, you need to communicate what you’re all about. To Write Love on Her Arms (TWLOHA) regularly posts quotes overlaid on beautiful images to their social media channels. They do this to connect with their supporters and bond over thoughts and ideas they associate with their brand. For example, the image below shares a simple message that nearly anyone could relate to—no matter who you are, where you come from, or what you stand for. The placement of TWLOHA’s logo within the image ensures that as the picture and quote are shared beyond their network, their organization continues to be associated with the idea. Small communications like this help to convey what TWLOHA stands for as a community. When the message resonates with an individual, they’re likely to realize they share something in common with TWLOHA. This can cause them to feel compelled to associate and identify with them. Swag and sold merchandise give your supporters the option to literally brand themselves as your community member. When designed strategically, merchandise can communicate what your organization embodies and works to achieve. For example, Love Your Brain Foundation’s online retail store sells products that align with their work in brain injury prevention and healing. Hats literally adorn the organ they work to protect. Supporters can also purchase items related to the organization’s wellbeing programs, such as a yoga mat. Design is just as important as the words you choose to communicate your brand. The Organization for Bat Conservation’s logo pictured below, is a great example of strong design. It perfectly embodies their mission by creating a heart shape within the outline of a bat. When used consistently, your logo, images, colors, and typography can all serve as visual cues to your audience. Consistency trains supporters and newcomers alike to develop certain expectations from your brand, that when met, develop feelings of trust and familiarity. 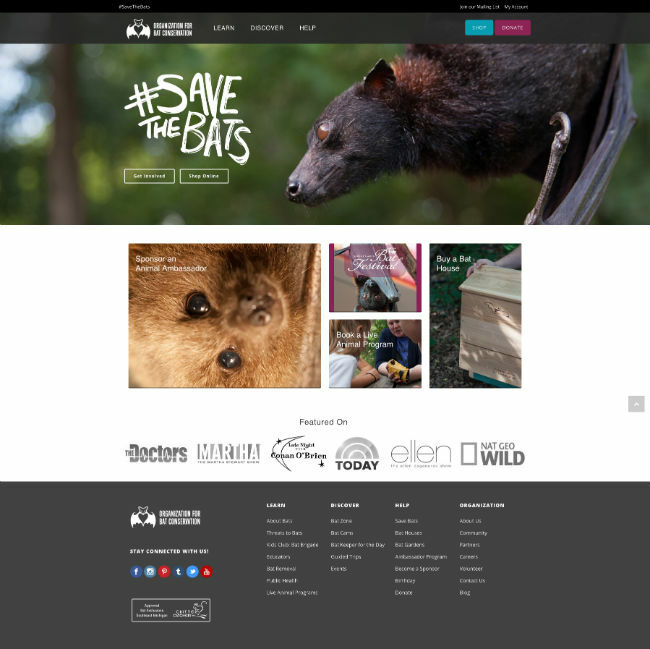 A visitor moving from The Organization for Bat Conservation’s homepage to a donation page will notice key design elements that carry over. For example, the color of the donate button on the homepage is then used as the color of the border on the donation page. Additionally, the header image of the bat on the homepage is also again on the top headline bar on the donate page. The Organization for Bat Conservation’s homepage leverages the power of simple design and large, eye-catching images. Here, their donation page ties in similar visual elements to create a fluid experience. Therefore, as your team develops your brandraising strategy, remember that your staff, supporters, and constituents all play a part in how your brand is portrayed and perceived. Enlist your community’s help and regularly take opportunities to incorporate their feedback to ensure your message is delivered as intended. In doing so, you will empower your community to elevate your brand even further.